Anuhea blends engaging lyrics, acoustic soul, pop, rap and reggae into a style that has earned her a reputation as Hawaii&apos;s #1 female artist. The singer/songwriter’s songs are a balance of fragility, strength and sass with the island style. Anuhea&apos;s signature guitar rhythms, sultry vocals and honest songwriting weave acoustic soul, R&B, jazz and hip hop with pop appeal into an unforgettable live concert. 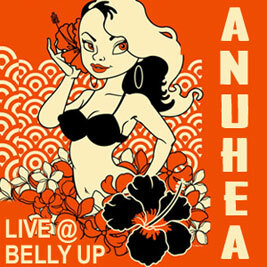 Recorded January 1st 2015 at the Belly Up this album features seven tracks including &apos;&apos;Only Man in the World&apos;&apos;, &apos;&apos;Higher than the Clouds&apos;&apos; and Anuhea&apos;s take on Estelle&apos;s &apos;&apos;Come Over&apos;&apos;. Anuhea sites Bob Marley Jack Johnson, India.Aire and Jason Mraz as her musical influences and it shows in her catchy uplifting music. Over the years on and off the island Anuhea as shared the stage with such artists as Bruno Mars, FloRida, Pepper, SOJA, Ziggy Marley, Taj Mahal and Jake Shimabukuro, Cas Haley and none other than Jack Johnson, one of her musical influences. Click here for more information about Anuhea.